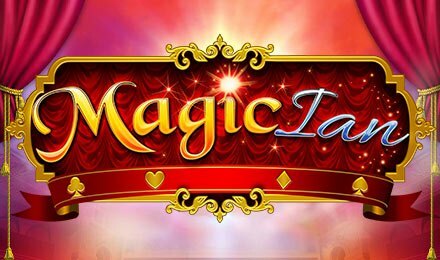 Ian’s spellbinding magic show has come to town on Magic Ian Slot at Wicked Jackpots! Created by Blue Print, the game comes with a 5 reel and a 25 payline slot. It’s easy to be bewitched by the Magician in this the game as the setting takes place in a gorgeous baroque theatre with reels such as cards, flowers, top hats, magic wands, locked boxes and the Magic Ian icon. Enjoy this enchanting game full of tricks and illusions that will keep you captivated for the rest of the show. Before seeing Ian pull a rabbit from his hat or flowers under his sleeves, just remember to log in at Wicked Jackpots or sign up if you don’t have an account. You can also adjust your betting options to your preference. Click on ‘Spin’ and match 3, 4, 5 symbols on a line for a win. To get The Circle of Magic Bonus, you will need 3 Bonus Scatter symbols. Bet Levels: There are no Bet levels available on Magic Ian Slot. Amount of Paylines Selection: There are 25 paylines that are active during the game with another 50 paylines that can be triggered on the Expanded Reels. Coin Values: The minimum and maximum values that you can set up is 0.25 or 125.00 respectively. Different wild symbols appear in the game, but the White Rabbit wild symbol replaces all the rest for winning a game except for the Ian bonus symbol. Expanding reels where the paylines increase to 50 with 8 rows high. Others include, Levitation Spins, Teleport Spins, Mirrored Reels, Chest of Wonder, Symbol of Surprise, Magical Streak, Shuffling Symbols, Bonus Boost and Super Bonus Spin. Pick up 3 Bonus Symbols on the same spin to play this round. You then get to select cards with extra features. The wheel will spin when a card mentions ‘Spin’ giving you an additional feature, such as: Cash Prize, Magic Rope Spins, Teleport Spins, Levitation Spins and Metamorph Spins.